In just two seasons in Tampa Bay, Flyers defenseman Andrej Meszaros went through two coaching changes, 12th- and 14th-place finishes in the Eastern Conference, a general manager swap, an ownership change and enough teammate turnover to make his head spin. When asked about what went wrong, Meszaros could do little more than shake his head. "It was different in Tampa," he said. "For those 2 years I was there, there were a lot of new guys, new coaches, new management. Everything was new. And then I had bad injuries and I missed the last 30 games of the [2008-09] season, and that slowed me down." Perhaps a coincidence, perhaps not, those 2 years were also the worst of his 5-year NHL career, at a time when the Lightning was counting on him to be their No. 1 defenseman. He was far from it. The Flyers traded for Meszaros (pronounced Meh-ZAHR-osh) on July 1. Lightning general manager Steve Yzerman jumped at the opportunity to unload Meszaros' salary-cap albatross for just a second-round pick. In his three seasons in Ottawa, Meszaros averaged 37 points without missing a single game. In Tampa, he never broke 17 points in a season and was a combined minus-18. Meszaros was clearly miscast as a No. 1. Although he is paid like a top-end defenseman, he could fit in anywhere on the Flyers' deep blue line from No. 2 through No. 5. "There is always some pressure, but obviously not as much as in Tampa," Meszaros said yesterday. "I didn't mind the pressure. There is always a lot of pressure. You want to be the best and you want to play a lot. We have eight good defensemen here, and they can play. It will be a good fit here." Here, he may not have the pressure to play like a No. 1 defenseman, but the Slovakian definitely will feel the heat to play to his salary. Only Chris Pronger and Kimmo Timonen earn more on the Flyers' blue line. And in a salary-cap world, teams can't afford to overpay for depth positions. "He is a top-end player," coach Peter Laviolette said. "He's a big body back there that can play against teams' best players. He plays in all situations. He puts depth on our blue line. I'm still not sure how the whole thing is going to play out, as far as who plays with who. We'll have to wait and see, when everyone gets back healthy. "We're certainly not viewing him as an 8- or 10-minute guy." Meszaros has had a very quiet preseason. The smooth-skating defenseman has one assist in three games, with eight shots. He is expected to see more playing time this weekend, as the Flyers open a home-and-home series with Buffalo tonight at the Wells Fargo Center. Sunday's game at Buffalo closes out the preseason. 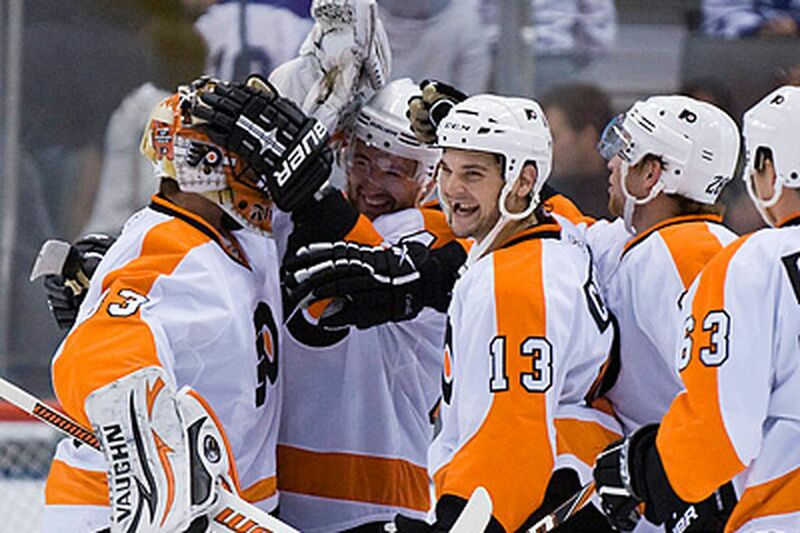 At just 24, Meszaros could be one of the Flyers' biggest surprises. There just hasn't been a big enough sample size. "I'm feeling great here," Meszaros said. "It's a new start for me, a new home. I'm starting to feel like I felt in Ottawa, where I played my best hockey. I hope I can play better hockey here and keep growing."